June 24th is a big day in Quebec. It’s the “national” holiday, by which I mean it’s recognized by the province, which considers itself a nation. Or something. I’m not going to delve into the deep political meaning of the day, because I don’t want to get into a discussion of separatism and federalism and the language laws and the government. Simply stated, it’s the feast day of Saint-Jean-Baptiste, or Saint John the Baptist, who is Quebec’s patron saint. Like all other summer holidays in North America, it is a day for grilling, beer, flags, and fireworks. And that’s all that really matters. A day to get together with friends and family, enjoy the time off work, and have a couple of burgers and a Molson while kicking back and fighting mosquitoes. That’s what you do when you’re in Quebec for the holiday, anyway. Far from home and without my fun and boisterous French Canadian family and friends, it’s hard to really get the party on. For my celebration, I had my morning coffee in my Quebec flag mug, and I greeted the cats in French for a change. They gave no sign, naturally, that they noticed the deviation from the norm. Instead of fireworks and beer, we had a day of Costco and laundry, and I popped over to Facebook a few times to see how others back home were celebrating. A day at the beach, hot dogs and champagne… even my sister, far off in Vancouver, draped a Quebec flag over her patio table for her coffee break. I set things right in my home by having poutine for dinner. Poutine, for those who don’t know it, is pretty much Quebec’s national dish. It’s a delicious mix of cheese and french fries covered in a brown gravy. Not just any fries or cheese or gravy will do, though, and so making poutine here in the States is a challenge. French fries are easy enough to get, and I sent Dave out to get some from Five Guys Burgers and Fries because they’re the perfect poutine fries. They’re equivalent to the ones at one of Quebec’s best poutine makers, the fast-food chain La Belle Province. You’re going to use these fries to sop up gravy, so they need to be soft enough to spear with a fork and flexible enough to curve into the corners of the bowl and get all the gravy. Five Guys gets it just right. I have packets of poutine sauce, so I made a batch while Dave was off at Five Guys. It’s just a basic brown gravy, nothing too fancy, but different restaurants back home have their own versions. I may try making my own one day, when I run out of packets, but I think it would be acceptable to use a generic “brown gravy” packet if necessary. The hardest part to get right is the cheese. Before you can even consider throwing some poutine together yourself, you will need to find the freshest possible cheese curds. Do not even think about using shredded cheddar or mozzarella, no matter what you’ve seen on the internet or tried in American restaurants. Ideally, you need “squeaky cheese”. Curds so fresh that they squeak between your teeth as you bite into them. Unfortunately, that’s not easy to find in my area, and probably not easy to find in much of the United States, but the grocery chain Wegmans sells a reasonable facsimile (right flavor, no squeak). There aren’t many Wegmanses around here, which is why I’ve never had the chance to make my own poutine before. Last week, though, the brand new store opened up in my neighborhood just in time for me to do this for Saint Jean! Hooray! Admit it. You want some. This entry was posted in Uncategorized on June 25, 2012 by antijen. 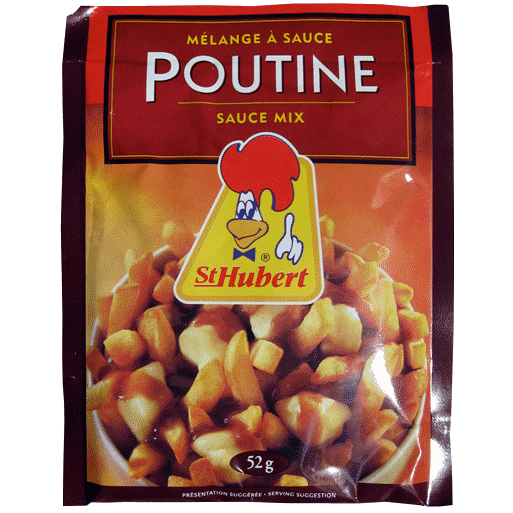 Eh la Québecoise, Bravo, maudit ça m’donne faim! !